Suite for iWork is a collection of more than 1250 templates for Pages, Keynote and Numbers. 1110 beautiful templates for Pages documents. 105 static and 25 action themes for Keynote presentations. 50 templates for Numbers. All-in-One app. 1110 pre-designed and elegant templates for your Pages documents. Whenever you need to create a great-looking invitation, brochure, flyer or any other kind of document, just select the template and replace the placeholders with your own content. It's that simple! All the templates provide you with professional-quality elements, amazing backgrounds, marvelous fonts, unique design and more.
? ?Every Keynote theme with moving background is available in several sizes, including full HD of 1920x1080 pixels. So everyone will find the perfect size for widescreen displays (16:9, 16:10), iPad (4:3) and different projectors. 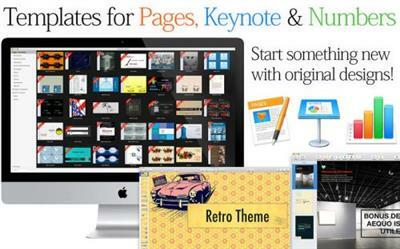 105 static themes for Keynote with static backgrounds for your Keynote presentations. 50 outstanding templates for Numbers spreadsheets. - 9 Keynote themes added.